THIS month the Toodyay Op Shop celebrates 40 years of giving back to the community so it’s a good time to recognise the achievements of founding member Shirley Patten (left). Shirley was born in Mt Lawley in 1934 and moved with her family to Wiluna when she was four. Wiluna was then a thriving goldmining town with three suburbs, four hotels and two bakehouses which were run by her parents Phyllis and Eric ‘Cobber’ Campbell. It was a carefree and happy time for Shirley and younger brother Keith who attended the town school, which included local Aboriginal kids. “We had an Aboriginal nanny after school and I loved her to pieces,” said Shirley. In 1945 Cobber moved the family to Toodyay to take up the dilapidated Wendourie Tearooms and bakery on Stirling Terrace where Amy’s Café and Toodyay pharmacy are now located. “Toodyay was a real culture shock to us.” laughs Shirley. “Only eight main families in town and all were related, including the Lees, Lloyds, Fergusons, Cooks and Chittys – we nicknamed them to tell them apart. A month after the Campbells bought the shops, the bakery was condemned and Cobber had to work hard to bring the family’s living quarters and the bakehouse back up to scratch. At the start, Cobber and Peter Lee (the other baker) mixed the dough by hand in long wide troughs, a step backwards for Cobber who was used to working with machinery. “The whole town turned out to watch the arrival of mixing machines from Wiluna and one side of the bakery had to be taken out to get them in,” Shirley recalls. Shirley left school at 15 after missing a lot of her education due to debilitating leg ulcers, which meant she had to be lifted around by her father and at times by milkman and future husband Eric Patten who lived across the road. “I didn’t like him and nor did our dog Tarzan who would chase Eric on his milk round,” Shirley said. From her early teens, Shirley was an integral part of the family business, delivering bread around town and eventually running the Wundowie bakery which the family had purchased. 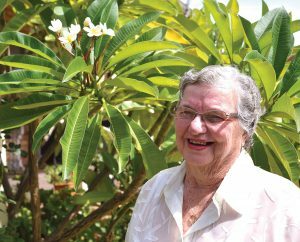 When Shirley was 18 she was pulled into a mixing bowl at Wundowie and nearly lost her life. “Cob hadn’t come back and the dough kept rising and rising,” she said. “I kept tucking it into the bowl but realised I would have to ‘knock it’ (punch the dough down to enable it to rise twice before baking). Luckily, Shirley had braced her feet against a table and the butcher’s boy next door heard her screams and ran to her rescue. By her late teens Shirley was ‘a looker’ and had caught the eye of Eric, who by then was a returned World War 2 veteran and captain of the Toodyay Fire Brigade. Eric didn’t get to walk her home the night she was crowned Belle of the Firemans’ Ball but he did make friends with the dog, and Eric and Shirley married in 1955 when she was 21. As the family grew, the Patten’s added rooms to their house in town, using a cement mixer Eric had given Shirley as an engagement present. “The whole town knew if you were building another room, another baby was on the way,” Shirley said. As a young mother of four children in the early 1970s, Shirley was active in the local preschool and eventually worked as a teacher’s assistant for the princely sum of $108 a fortnight. The preschool needed bigger premises and Shirley approached former shire CEO Brian Harris who asked her to pick a block of land in Hamersley Street. “Ian Murray was the shire president and it seemed to go up overnight,” Shirley said. In 1975 the pre-school was taken over by the State Government. The out-of-town mothers who helped at the preschool were left with three hours of spare time and Shirley decided to organise them to raise funds to build independent living units for Toodyay’s senior citizens – Butterly Cottages. She started the Toodyay Op Shop, which grew gradually from a base of eight volunteer mothers who staffed it. The Op Shop was started next to the former Toodyay Tavern before moving to Connor’s Cottage in Piesse Street and finally to its current location in Stirling Terrace. “The Op Shop’s first takings ($200) went to Butterly Cottages but over the years we have given $600,000 to all of Toodyay’s community groups,” said Shirley who was voted 1977 Toodyay Citizen of the Year. Lending a hand to people in need is second nature to Shirley. From her family supplying meals and looking out for the town’s old characters such as ‘Corporal’ Campbell, ‘Happy’ Donegan and ‘Crusty’ Lloyd, Shirley’s need to contribute has been integral to the establishment of three valuable Toodyay institutions – the local preschool, Op Shop and Butterly Cottages. If only she had found the time to take on the swimming pool.